A hidden secret eatery located out in the middle of nowhere. It's located in Burlingame, but not the Broadway or Burlingame Ave. Instead, it's located on the opposite side of 101 near SFO International Airport off the Millbrae Ave exit on 101. For those living in the SF Bay Area who love Sam's Chowder House originally opened in Half Moon Bay (with food trucks and a new store in downtown Palo Alto), New England Lobster Company might be a lot closer, and just as good! 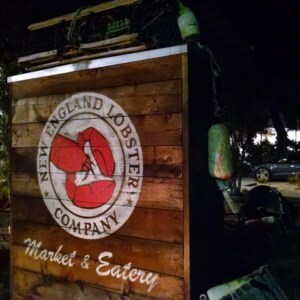 If you haven't tried New England Lobster Company's Eatery yet and you like lobster, I highly recommend dropping by for a taste! Check out New England Lobster Company's official website and visit them in person at 824 Cowan Road, Burlingame. The most important thing about eating any type of seafood is freshness! And to that point, I strongly believe New England Lobster Company has the freshest lobster available on the west coast. According to their website, they have the largest tank capacity (75000 lbs) of lobster with deliveries 5-6 days a year, with yearlong availability. They supply restaurants, grocery stores, hotels, cruise lines, and more. With that scale, their own eatery is guaranteed to always have a fresh supply of lobster! Their eatery is mostly self serve. You line up and order at the cashier from their extensive menu. Lobster Rolls range from about $20, and then there are several other ways you can order Lobster including freshly boiled. Your order is assigned a number which you place table side. As your order is ready, the lobster gets delivered to your table. It is entire up to you to find available seating, and they have benches available indoors and outdoors (for warmer days). When I arrived for dinner on a Friday for dinner (not happy hour), there was no free spaces in their parking lot. I had to park at the end of the road, which was fine since it was a nice warm day. The Lobster Rolls were perfectly cooked, but more heavily seasoned than I am use to. It was still delicious. One thing I had for the first time was a whole lobster boiled and presented on a plate (like I eat crab). That was quite an incredible experience. I loved it, and it's much closer than Sam's Chowder House. I have been to Sam's Chowder house 4-5 times, mainly because it was the only places in the area I could find Lobster Rolls. I have never tried Lobster Rolls in Maine, but I hear they are cheap and delicious! But honestly, the Lobster Rolls from New England Lobster Company and Sam's Chowder house are very similar. Both are good (unlike some bad Lobster Rolls I've had on vacation where the bread is all soggy). I would note that New England Lobster Company's lobster rolls are more seasoned, but there is a non-seasoned version I may try next time. In terms of the view, Sam's Chowder house wins hands down with views of the ocean. Sam's Chowder house also has a wider menu variety, but I always end up ordering the lobster roll. However, because New England Lobster Company is much closer to where I live, I am more likely to return to New England Lobster Company due to the convenience. All in all, the overall vibe of New England Lobster Company was pleasant and environment is perfect for casual conversations. I do plan on returning, possibly with some foodie coworkers for their happy hour (which I expect to be very crowded)! I've already recommended the place verbally to several other people.